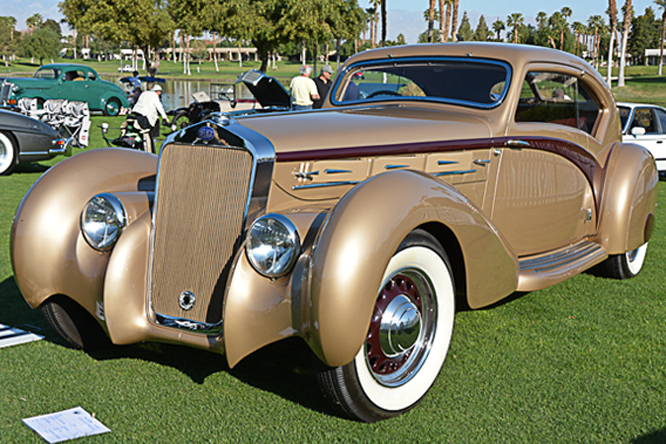 In July 1930 Chrysler launched the second generation CG Imperial referred to in the sales literature as the Imperial 8. 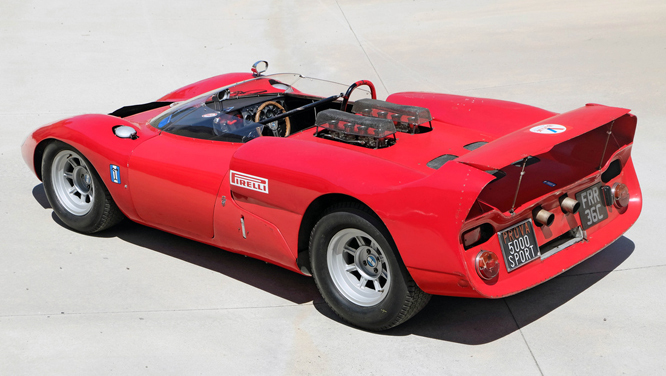 The 8 referred to the new L head 6.3 litre 384.8 cubic-inch, nine-main bearing straight 8 motor which developed 125 horsepower in it’s original incarnation. 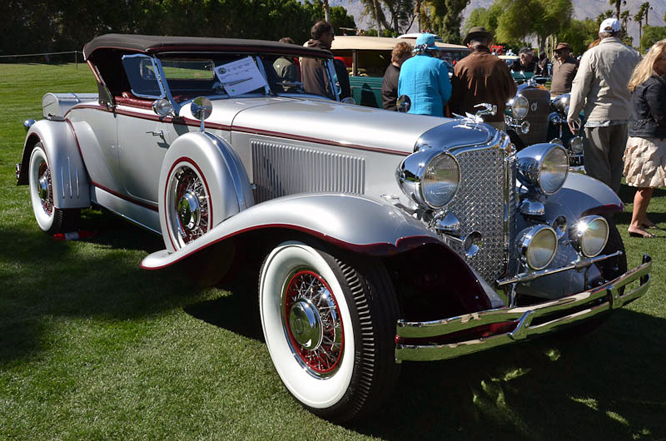 The CG’s chassis has an imposing 145″ wheel base, the same as a contemporary Duesenberg. 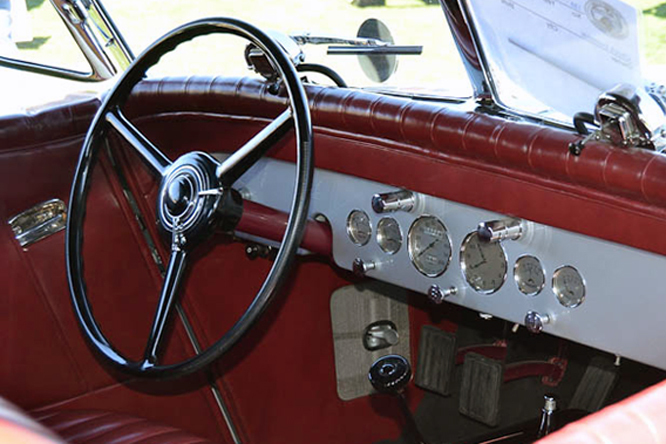 Imperial 8’s could be ordered with either roadster, coupé, saloon / sedan or limousine bodies, the latter could be ordered with a way ahead of the curve dictaphone. 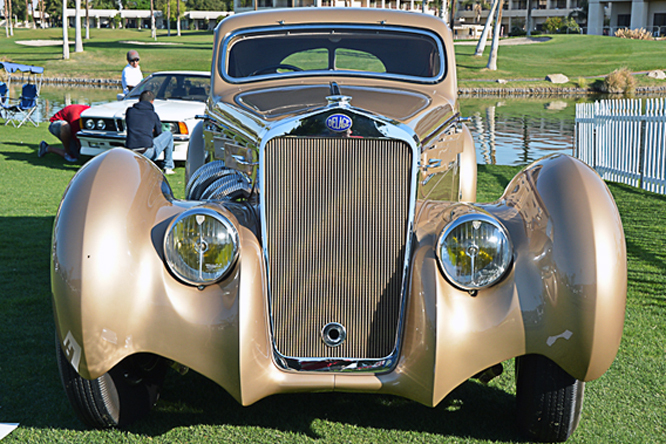 This particular car photographed by Geoffrey Horton at the 2013 Desert Classic meet in Palm Springs is a 1931 CG with a prototype body by LeBaron. 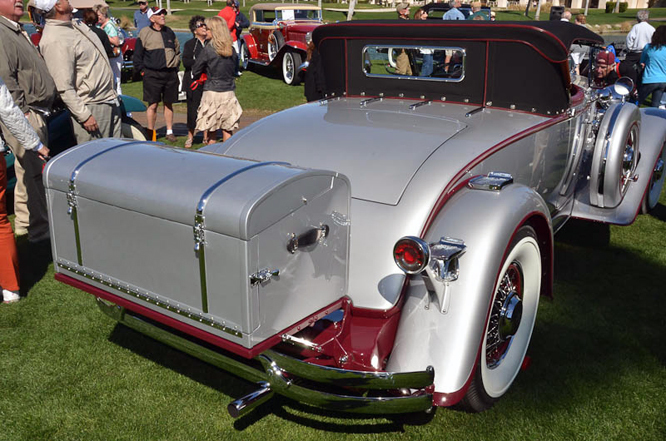 Unusually this roadster, which is believed to have been taken to the Chicago Auto Show, has no running boards. 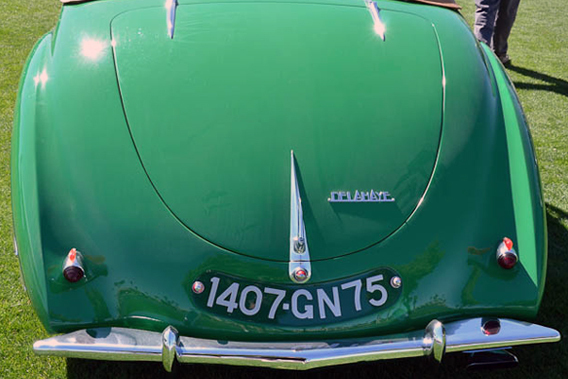 When the current owner bought this car he it restored in burgundy and silver in the absence of any knowledge as to the cars original colour scheme. 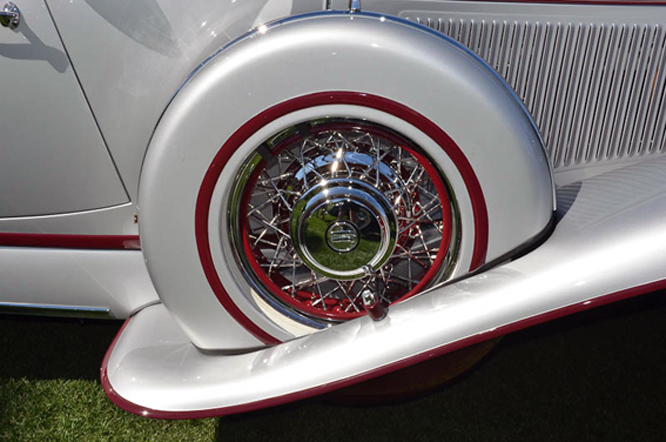 The 145″ CG Imperial 8’s were only manufactured for one year the succeeding CL only had a 133″ wheel base. 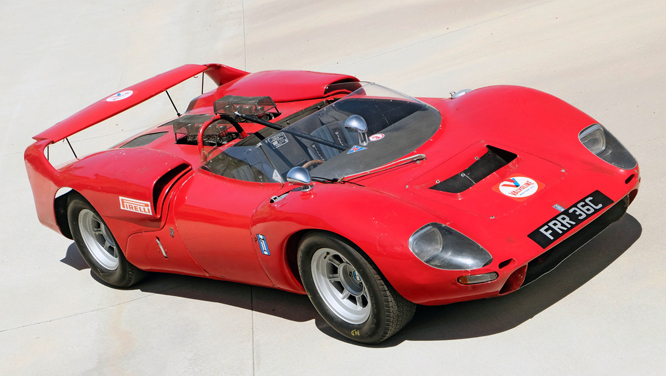 Thanks for joining me on this “145 Inch Prototype” edition of “Gettin’ a li’l psycho on tyres” I hope you will join me again tomorrow. Don’t forget to come back now ! 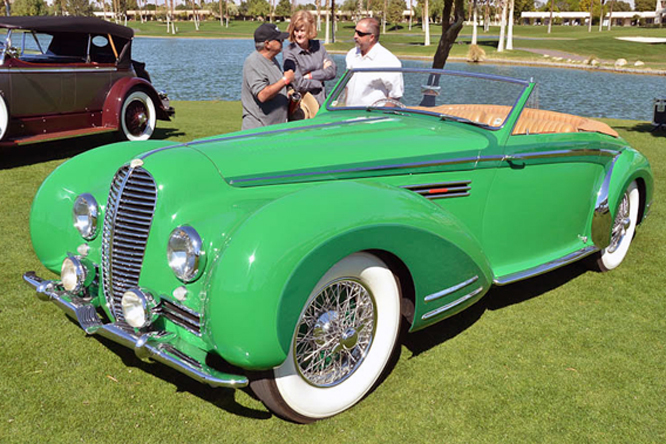 This entry was posted in Uncategorized and tagged 8, CG, Chrysler, Colmar, Desert Classic, Geoffrey Horton, Imperial, LeBaron, Palm Springs, Psychoontyres, Ralph, Roadster on April 9, 2015 by Ralph. 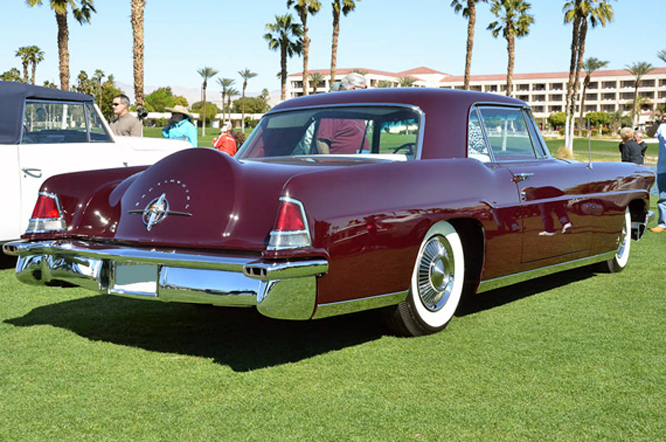 Continental was designed to be a stand alone luxury and elegance brand from Lincoln to compete with GM’s Cadillac and Chrysler’s Imperial Brands that would build on the success of the 1940’s Lincoln Continental. 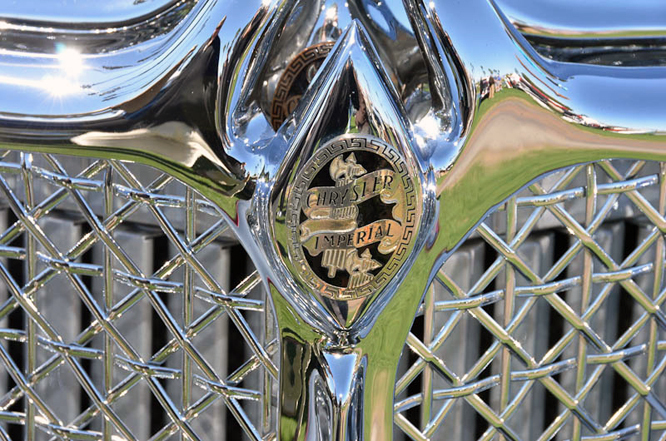 Having considered and rejected the idea of employing an outside team to design such an important vehicle Ford designated a team from it’s own special products division comprising chief stylist John Reinhart, chief body engineer Gordon Buehrig assisted by Robert McGuffery Thomas and chief engineer Harley Copp to design the Continental Mark II in late 1952. 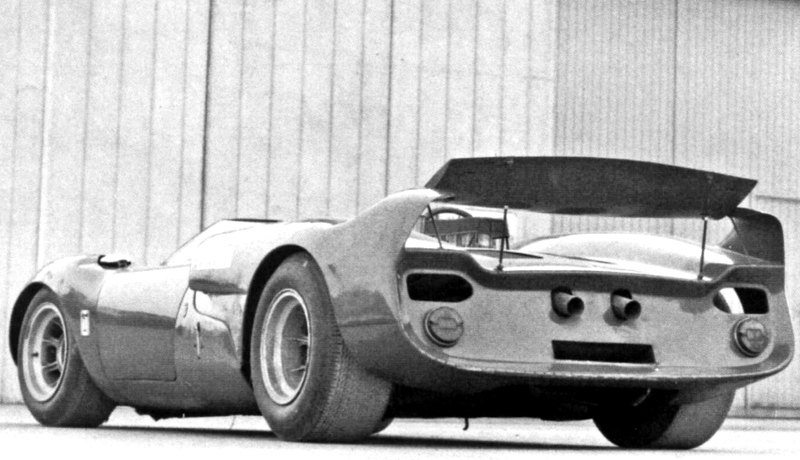 Ford had hoped to build the car using unibody / monocoque construction but Copp is credited with rejecting the idea on grounds of tooling costs for what was always intended to be a low volume hand built vehicle, and so the car was built with separate chassis and body. 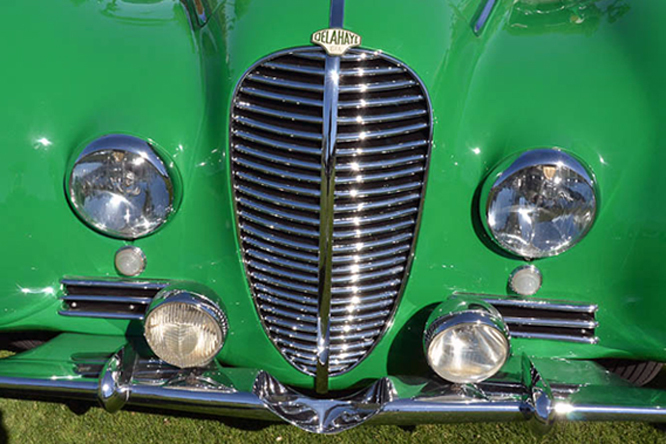 For a car that was launched in 1956 there is a remarkable absence of chrome work giving it, size not withstanding, a refined European look. 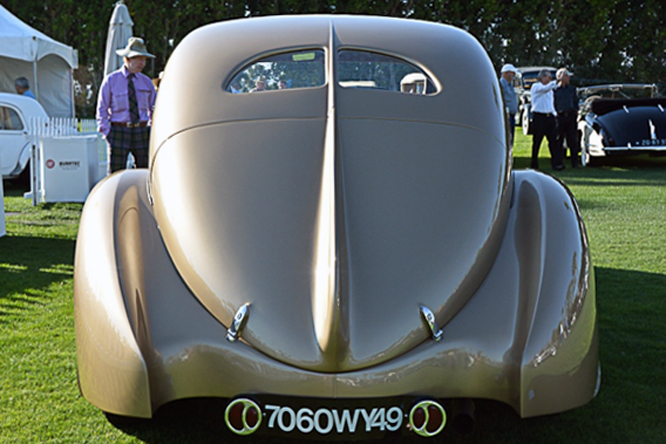 Power came from a factory blueprinted (hand made from closest to specification hand picked parts), 6 litre / 368 cui Lincoln V8 that was tuned to give 300 hp. 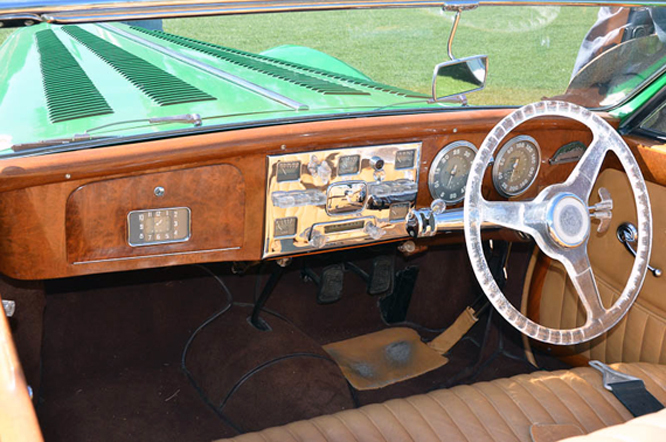 The likes of Continental owners Elvis Presley, Frank Sinatra, and the Shah of Iran had only one option choice to make, wether or not to have the US$595 factory fitted air conditioning or not. 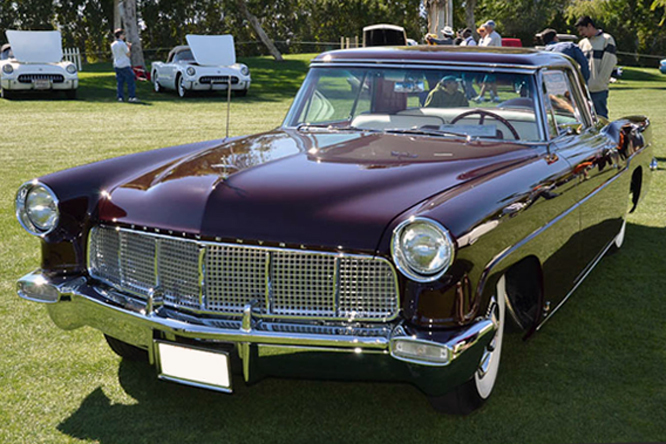 Elizabeth Taylor was given a Continental Mark II by Warner Brothers that was specially painted to match the colour of her eyes. 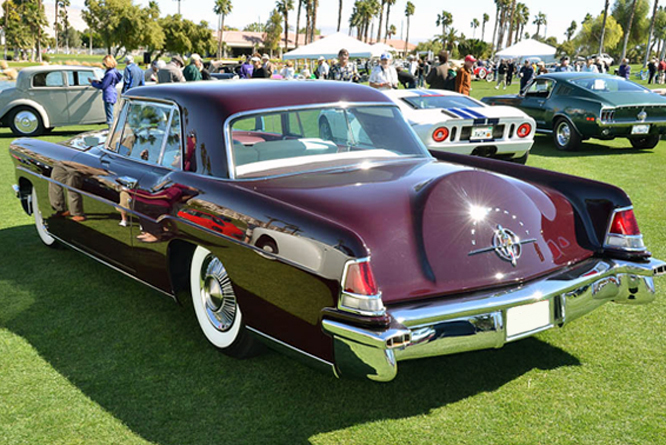 Priced at US$ 10,000 in 1956 the Continental cost the same as a contemporary Rolls Royce or two Cadillacs, until the arrival of the US$ 13,074 Cadillac Eldordo Brougham in 1957. 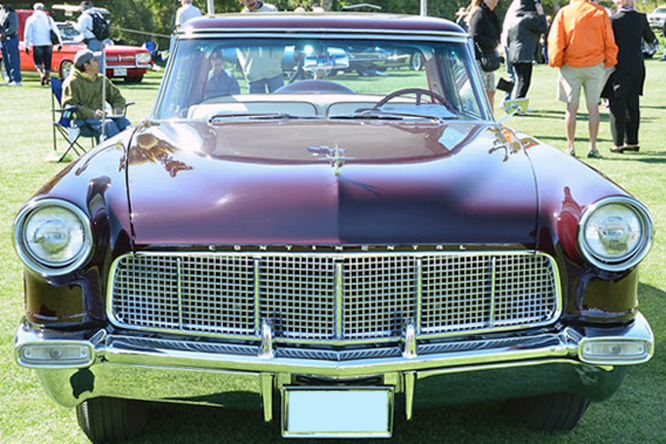 Surprisingly Ford reckoned they were loosing US$ 1,000 on each Continental Mark II built. 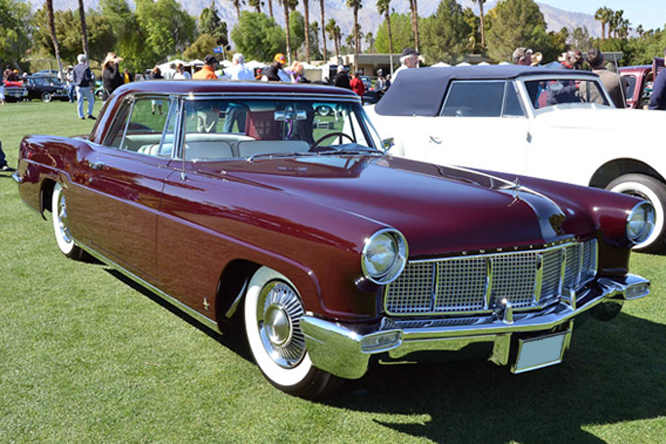 Between late 1955 and 1957 around 3000 Continental Mark IIs were built at the end of the production run the Continental brand was reabsorbed into the Lincoln brand and the name hence forth continued as a Lincoln model name. 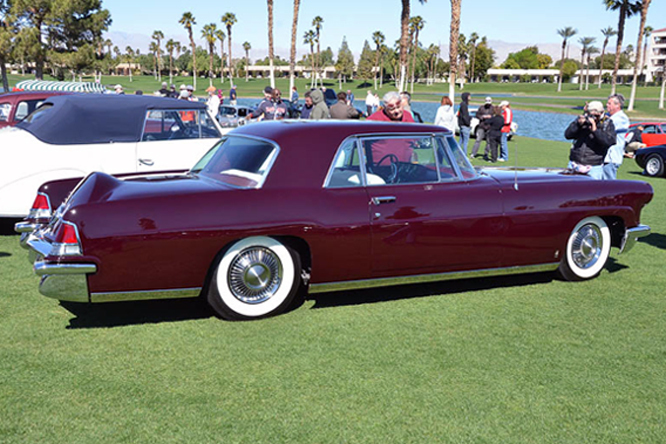 My thanks to Geoffrey Horton for the photographs of today’s featured 1956 model seen earlier this years at the Desert Classic Concours d’Elegance at Palm Springs. Thanks for joining me on this “Luxury Elegant Loss Leader” edition of “Gettin’ a li’l psycho on tyres” I hope you will join me again tomorrow. Don’t forget to come back now ! 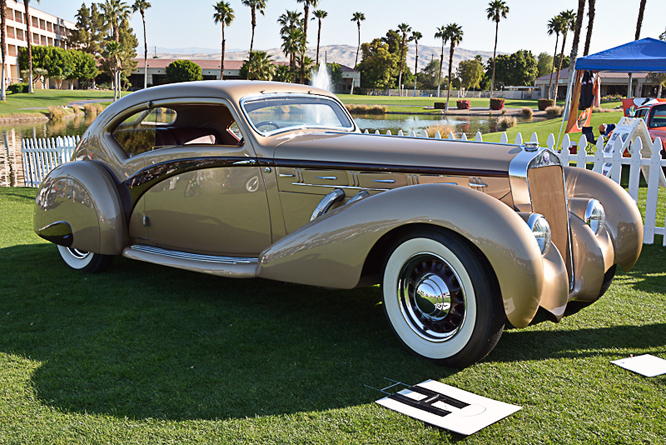 This entry was posted in Uncategorized and tagged Beuhrig, Cadilac, Colmar, Concours d'Elegance, Continental, Copp, Desert Classic, GALPOT, Geoffrey Horton, Imperial, Lincoln, Luxury Car, Mark II, McGuffery Thomas, Palm Springs, Presley, Ralph, Reinhart, Rolls Royce, Shah of iran, Sinatra, Taylor, Warner Brothers on April 11, 2013 by Ralph. 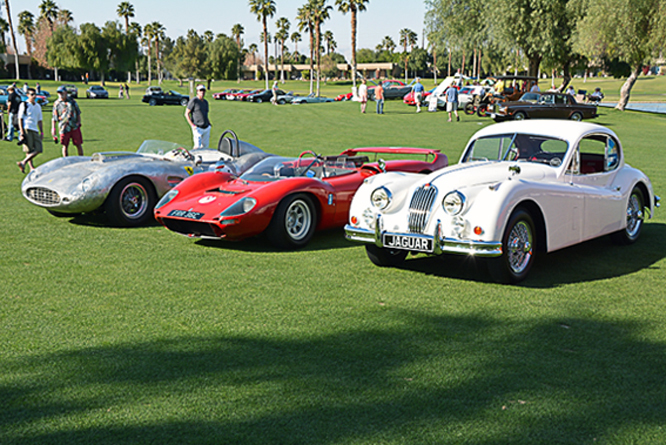 This year the Desert Classic Concours d’Elegance moved to the Desert Princess Country Club and Doral Desert Princess Resort in Palm Springs California on February 24th and Geoffrey Horton has kindly sent sent today’s selection of photographs to us an overview of some of the vehicles present. 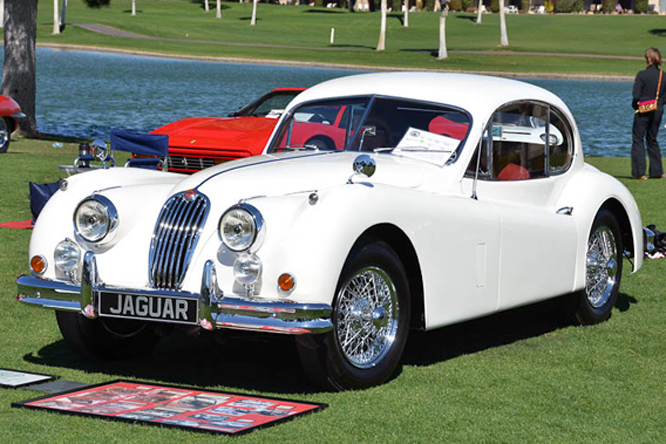 Geoffrey own 1955 Jaguar XK140 FHC SE/MC was looking more resplendent than ever in the spring California sun. 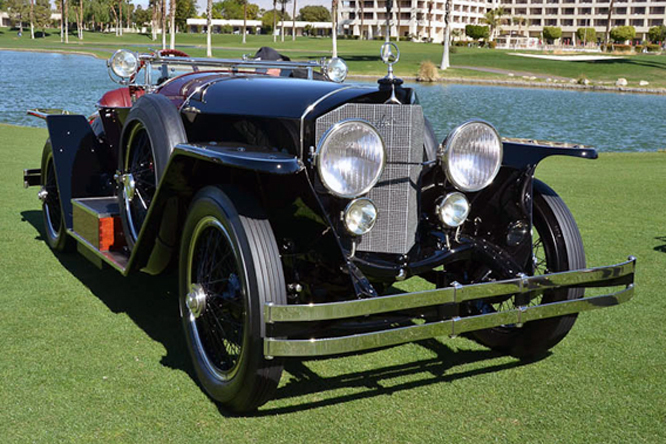 When I saw this photo of a 1923 Mercedes Benz 28/95 I wondered if it was perhaps a creation from Gary L Wells workshop but in fact this beast with a 7.2 litre / 439 cui six cylinder aeroplane motor converted for road use is all the work of Mercedes Benz. 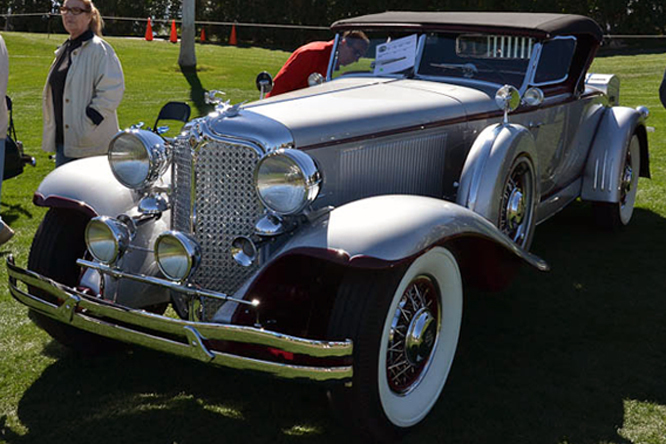 The short wheel base version of the roadster, like the one seen here, was originally given the Targa Florio name after Mercedes Benz victories on the torturous Sicilian track in 1921 and 1922. 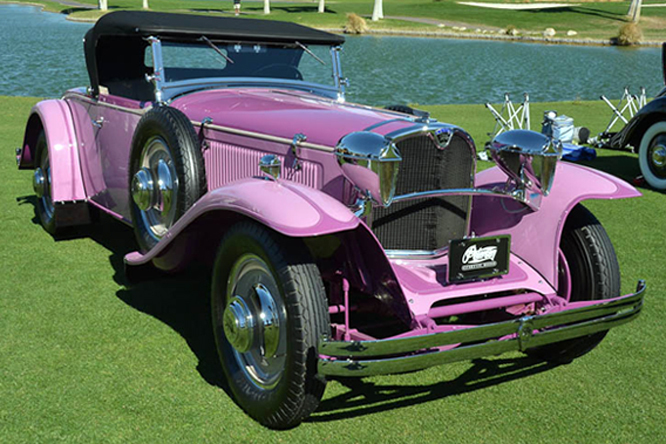 Looking similar to a Cord L29 is this 1929 Ruxton Model C which like the Cord L29 has front wheel drive and a straight 8 engine but unlike the Cord L29 of which 4400 examples were built only 500 Ruxton Model C’s are thought to have been built the two tone lilac paintwork is standard for the period. 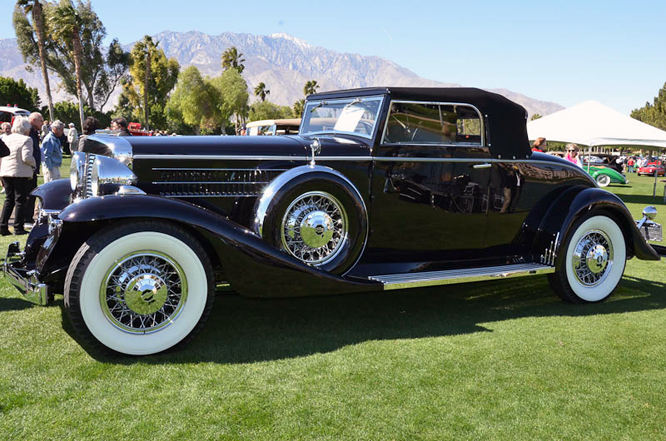 Last year Geoffrey shared photo’s of a Marmon V16 Limousine, above is the last Marmon V16 sold in 1933, a Coupe version of which just 5 others are thought to remain. 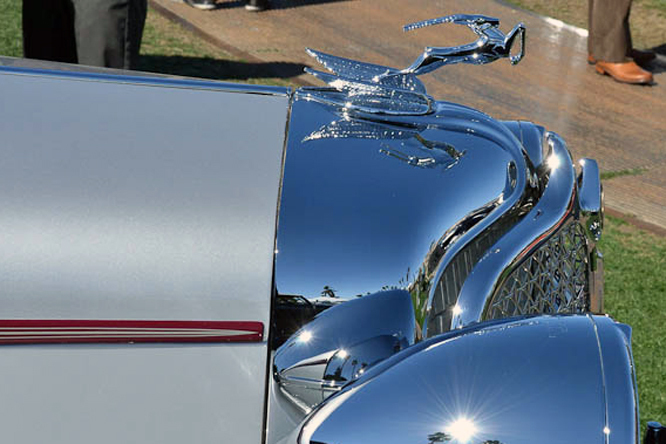 Although powered “only” by a 6.3 litre / 384 cui straight 8 Geoffrey’s car of the show was without question this 1931 Chrysler Imperial which appears to have a sheen just a little brighter than all of the other vehicles seen on the day. 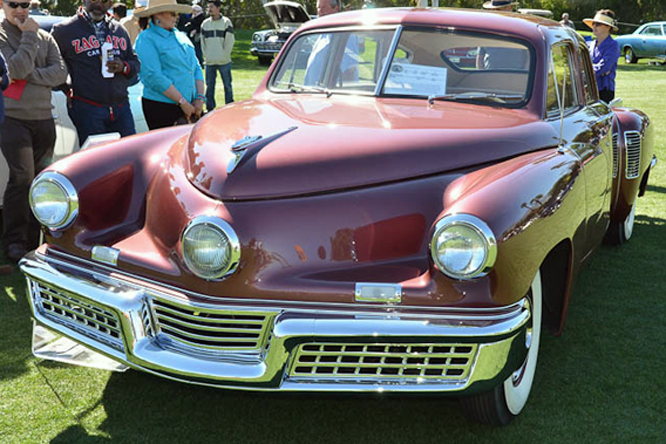 This 1948 Tucker 48 chassis #1003 featuring a motor in the boot / trunk and rear wheel drive is one of 51 built and is expected to fetch between US$1.5 and 1.9 million at auction on March 9th. 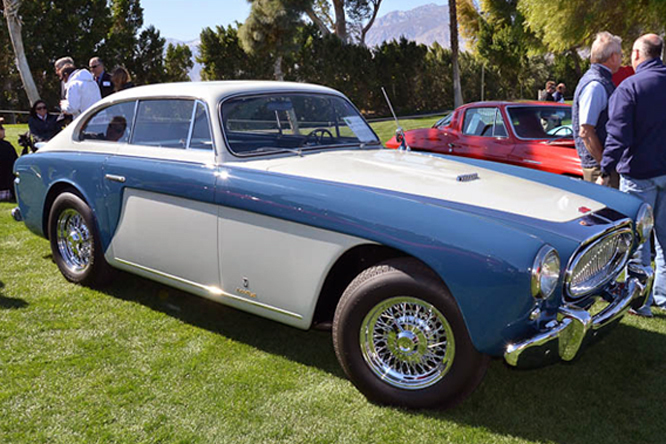 Moving forward five years this 1953 Cunningham C3 is one of 20 Roadsters built in West Palm Beach, it is fitted with 331 cui Hemi V8 and was shipped to Turin for coachwork to be fitted by Vignale. 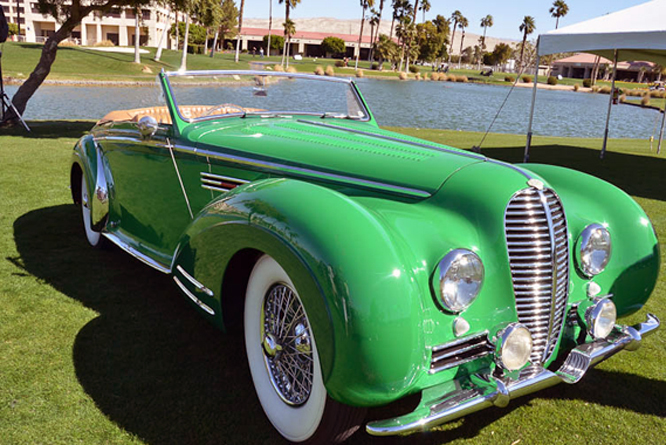 In addition to the roadsters Cunningham built 5 C3 convertibles. 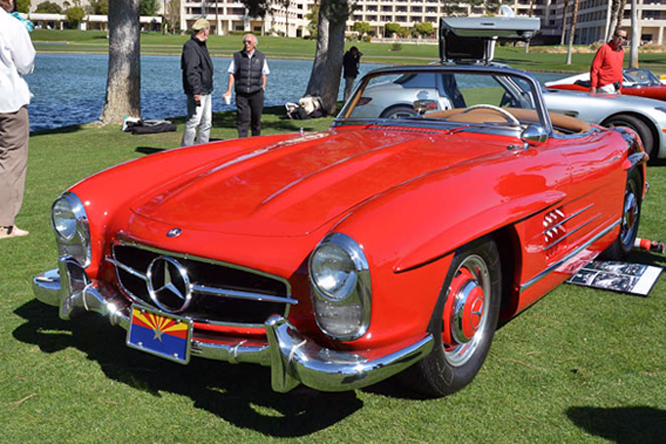 This US Spec 1957 Mercedes Benz 300SL Roadster would have originally been distributed by Studebaker Packard Corporation. 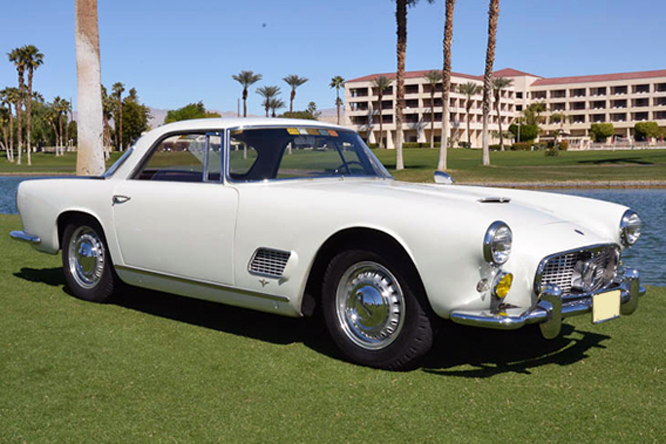 According to the owner of this 1959 Maserati 3500 GT was sold new in Mexico and it “may” have once belonged to left wing Mexican President Adolfo Lopez Mateos. 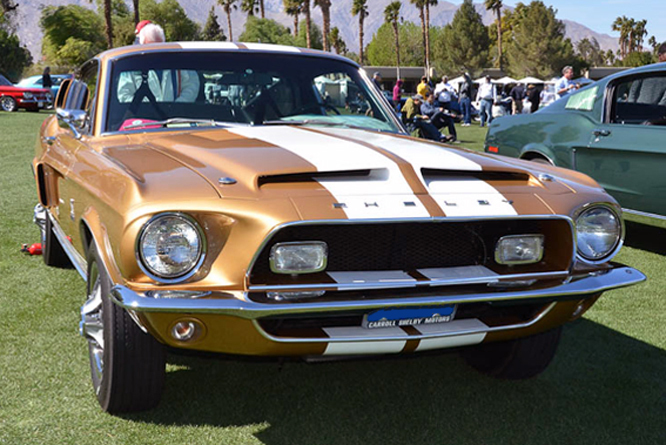 The 1968 Shelby Cobra GT 500 above is fitted with a 428cui interceptor motor and had clocked well over 100,000 miles prior to a two year restoration in 2005, since when it has won a Best in Show award at the 2007 Cobra Owners Concours and been drag raced at California Speedway. 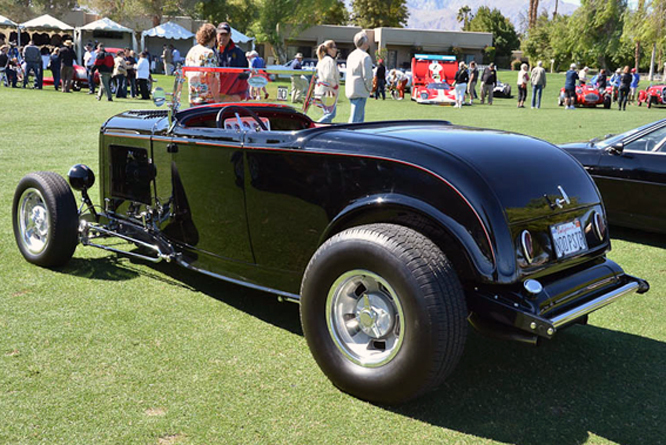 Geoffrey tells me the ’32 Ford Roadster above belongs to well known IMSA racer Rick Knoop and packs 400 hp. 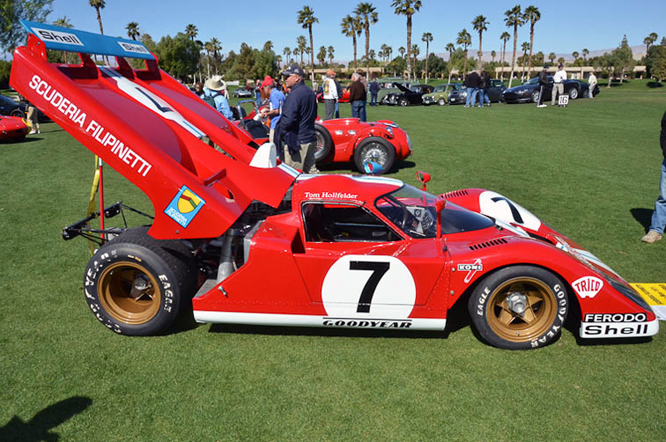 Finally a Friday car this much modified Ferrari 512 S was upgraded to M spec in 1971 and upgraded further by the Filipinetti team with a Porsche 917 windscreen to what has become known as M/F spec. 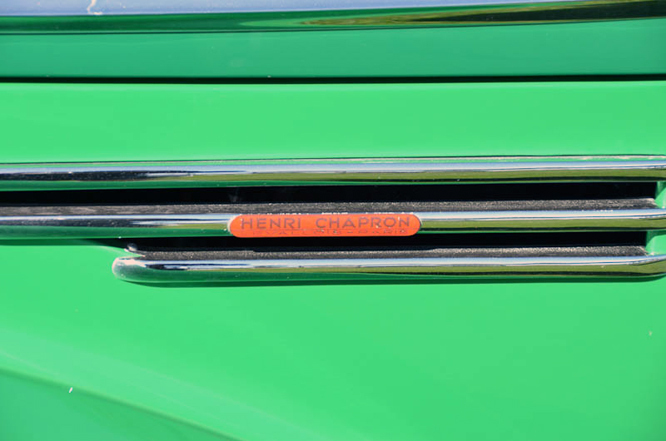 Drivers of the car in period include Ronnie Peterson, Henri Pescarolo, Mike Parkes and Joakim Bonnier. My thanks to Geoffrey Horton for sharing his photographs and a smidgen of welcome California sunshine. Thanks for joining me on this “Palm Springs” edition of “Gettin’ a li’l psycho on tyres” I hope you will join me again tomorrow. Don’t forget to come back now ! 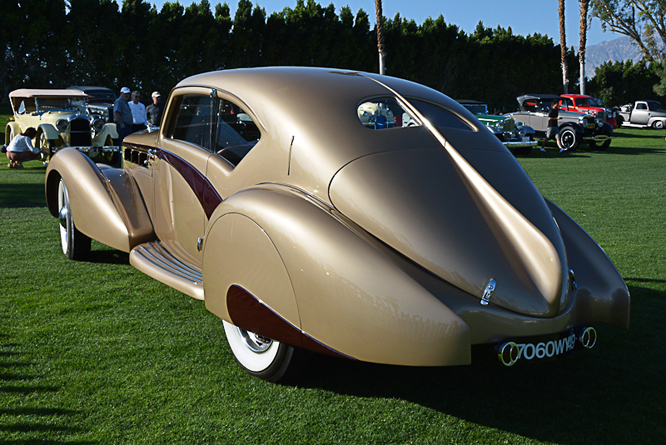 This entry was posted in Uncategorized and tagged CA, Chrysler, Colmar, Cunningham, Desert Classic Concours d'Elegance, Ferrari, Ford, GALPOT, Geoffrey Horton, Jaguar, Knoop, Marmon, maserati, Mercedes Benz, Palm Springs, Ralph, Ruxton, Shelby, Tucker on March 6, 2013 by Ralph.